Randy Combs had spent his entire career figuring out the best way for companies to sort and handle materials. As an electrical engineer implementing conveyor systems, he grew to dread one thing: working in the field. "In the field" was where time slowed down, costs ran up, and profits diminished. Randy wanted to change that. If it took four weeks to set up a conveyor system in the field, Randy wanted to cut it to two. In 2000, he founded Insight Automation with the goal to create the products and materials to help companies program and build conveyors faster and easier. Needing to fund the development of his idea for a revolutionary conveyor controller, Randy and his Insight Automation crew provided engineering services to help clients solve materials handling problems. In 2001, Insight Automation was able to partner with Industrial Software to create the controller they'd been dreaming of, ConveyTrax, a family of controllers with the logic for the most common conveyor mechanisms built in. Complex conveyor layouts could now be configured without PLCs or programming—making it faster and cheaper to install. The conveyor controls were so revolutionary that they were immediately noticed by one of the largest materials handling companies in the world—the United States Postal Service (USPS). USPS purchased more than 100,000 controls from Insight Automation to power its AI and Postal Flats Sequencing Systems which reduced city carrier workload by 85%. Now that his dream of better conveyor controls was a reality, Randy shifted the focus of Insight Automation to developing more innovative materials handling products and less on custom engineering work. In 2008, Insight Automation with Industrial Software partnered with Kyowa Manufacturing Limited to create the PulseRoller brand. Kyowa Manufacturing provided the PulseRoller line of 24-volt DC motor drive rollers, Industrial Software provided the electronic control boards, and Insight Automation provided the sales distribution, research and development, and market research to develop the brand. Together, the three companies had created a complete package for low-voltage motorized conveyor systems. But Insight Automation and its partners weren't satisfied; they continued to develop cutting-edge conveyor technology to cut more time and cost in the field. 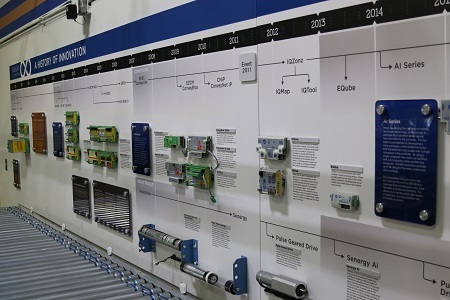 In 2007, the original ConveyTrax conveyor controller made way to ConveyLinx, a family of Ethernet-based control modules that can be used to control an entire conveyor system using several industrial-based Ethernet protocols. This simple, stand-alone conveyor control can be configured by anyone with a simple press of a button; yet, it can still be custom programmed for more complex conveyor needs. Today, Insight Automation, with the assistance of its partners, continues to strive for engineering excellence and product innovations to advance your competitive position. We will continue to develop conveyor controllers and 24-volt DC drive products that reduce energy consumption, improve safety, and lower your costs. Drop us an e-mail, and let's talk about how we can help your team.